The time of our childhood influences our attitudes so much! That time of parental and cultural input really makes us what we are, I think. My brother and I were greatly influenced in our attitudes by the experiences of our youth and the leadership of our parents. We were taught to honor and respect those who fought for the rights and freedoms of our nation and what a patriotic commitment required of the individual who made that commitment, even to the sacrifice of one's life for the sake of the nation. We were fortunate that our father was just old enough, I guess, to not be drafted in the time of World War II. However, some extended family members were active in the Great War and some even gave their lives. For that reason I am more aware of that war that our country participated in than others. The impact of that war came closer to my family than did others. It is natural for me to be reverent and be grateful for those who sacrificed for the nation because of my up-bringing. Hopefully I have inspired that awe in my children and that they can pass that respectful attitude on to the grandchildren. Give thanks and remember the fallen ones. Express your gratitude and celebrate your freedom! At Heirlooms & Comforts this week we will feature Clean Off the Bolt Week. In celebration of Memorial Day this week we will also punch your Fab Card for fabric purchases including the Clean Off the Bolt purchases. That means that when you buy all that remains on a bolt you can also get your card punched for the purchase amount. Whoo-hoo! We have never done that before as I can remember. Only this week and only to help you be aware of Memorial Day. It is like this: regular Clean Off the Bolt discounts of 25% on regular price fabric when you take all on the bolt or another 10% off a sale price fabric when you take all on the bolt PLUS we will punch your Fab Card. Take advantage of our craziness now. It may never happen again. Independence Day, July 4 - Closed July 4, 5, 6, and 7. Carolina Shop Hop - July 13-21.
Who was it - Louis Armstrong? - who had a hit recording "What a Wonderful World"? You know, no matter who sang that tune, it is a wonderful world. When you observe the beauties of nature right in your own backyard it is pretty amazing from the plants and flowers that you love to the pesky vegetation that you hate. It is amazing how English Ivy can invade everywhere and be lush green and be so pesky. Well, Bobby and I cut (not easy) the vines at the roots near the trees that it has invaded and we pulled (not easy) it from the bark, and then it was like the trees said, "Thank you for the fresh air and sunlight!" The yard seems to breathe again. This is only one example of the wonder of nature; just think about Kudzu. Now there is a pesky plant, but did you know there are beautiful artifacts made with the parts of that stuff. So what about animal life? I planted beautiful Dahlias, so lush and colorful and happy. Along came the slugs and now I only have a few bare stems with no hope of recovery. Slugs! Creepy, slimy, oozy creatures created by the Almighty. Have you ever tried to squash one to death, hating the varmint that ate your flowers? I couldn't squeeze it to death between my gloved fingers! Finally, I asked Bobby to stomp it and with that broad foot he was able to accomplish the deadly deed: two fewer slugs to eat my flowers. I do believe that it is a wonderful world. I do believe that all God's creatures and creation have purpose, even if I only see the pesky side of some parts of it. Thank God for life in all forms. 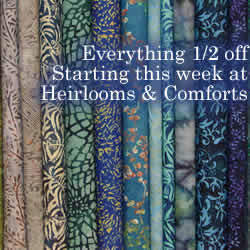 At Heirlooms & Comforts this week we will feature wide fabrics for quilt backings at 20% off. We have a new stock of goods that are 108" or more in some cases. These make backings that usually do not need to be pieced to become large enough to serve as the back of a quilt. This is an infrequent opportunity to get these fabrics at a discount. Measure your quilt tops and come in this week for the quilt backs! If you will notice on Husqvarna Viking's web site there is an announcement of a contest to win a Tribute 140C sewing machine by entering a contest with some item that you have sewn on a Husqvarna Viking sewing machine or sewing/embroidery machine. At least one of our customers has entered the contest and her project looks GREAT alongside the other entries. You can enter the same way that Carole Corn has entered. The rules are listed on the web site and entry is not difficult if you have a camera that you can use to email a photo. Carole made her entry piece on the Husqvarna Viking Lily 555, not even her newest machine. So no matter which model you used to construct your project, you can enter it in the hopes of beating Carole out for the Tribute 140C and its accompanying stuff. Entry time is up May 31. By the way, if you don't win you can still purchase the Tribute 140C machine that commemorates the 140 years of Husqvarna machines. There is a remarkable price for the machine and a free $250 anniversary kit that comes with it. See us soon; this is a limited edition machine! Let's see if I can say what I wish to express without getting too sappy here. Mother's Day. This is a good time to reflect on the mothers who have preceded us and how they sacrificed and made do for themselves so that they could provide their families with the best possible situation for growing up. They worked at home and away from home for long hours to make life easier for their offspring. They nurtured their little one (and big ones) with TLC and with discipline in order to raise good citizens. We are forever grateful to them for all they did for us. We love to recall the stories of their life's works that made all possible. Some stories are funny, some are sad, some are just nostalgic, but all are dear. So how are those mothers and their stories different from the ones we can see around us today? Not very. Mothers have different situations now than they did 20, 30, 40 years ago. Home appliances are different. 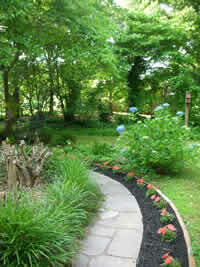 Interruptions and obligations for work and for recreation are different. Opportunities for achievement and for failure are different. I see young mothers who work long hours and still provide the opportunities that the youngsters need for social development and physical development. It just is not the same world that our mothers dealt with in many, many ways. I give "hat's off" to mothers of all ages! For the physical pain and sacrifice, for the emotional expenditure, and for the love that is shown in so many ways, I salute those who choose to raise a family!! Happy Mother's Day. At Heirlooms & Comforts this week we will feature double punches on your H&C Fabric Card for every $5 increment of Batik fabrics that you purchase. If you buy $15 worth of batik regular price fabric you will have your card punched for 30 points. Think how fast your card will fill this week with the purchase of the beautiful batiks that we have in stock and how fast you can qualify for a $20 redemption using your Fabric Card. Many times we have talked about the stages that we go through in life. Once again there seems to be one developing down the street from my home now. The two-an-one-half year old, curly-headed boy is beginning to show an interest in the adult size bed in his room. Do you remember that stage of your children's development? That is a giant step forward in life, when you get your own "big bed". That is when my mother would produce (or find an appropriate one in the closet) a big-boy quilt as a reward for the giant step. There were "Farmer boy quilts", lavender flower quilts, Ohio Star quilts and even Tiger Paw quilts. Now this is going to test Grandma's speed and creativity to see if again I can live up to the standard set by Mema. Cross your fingers for me! At Heirlooms & Comforts this week we will feature pre-cut fat quarters at a special price: $2.75 each; 6 for $12; 12 for $22; 18 for $32; or 50 for $75. After this week fat quarters will be priced at $2.95 each. Any custom-cut fat quarters this week will be $2.95 each. Plan now for a scrap quilt or one that is built around fat-quarter increments. Do it early in the week so you can get the best selection from the fat-quarter bin! At Heirlooms & Comforts we want to highlight several models of Husqvarna Viking machines. The Tribute 140M and 140C are 140th Anniversary models which are very distinctive in appearance with the Red cover features. They each have great features: the 140M has needle-up selection capability which is unusual for a mechanical machine and the 140C has the extra length in the throat and has the Exclusive Sensor System feature similar to models up the line. At H&C these are Value Priced for your benefit. A bonus Sewing Bag of accessories (a $250 value) goes with the 140C as well. Check them out soon. Topaz 20 machines are sale priced now, too. The price on these machines is so low we are not allowed to advertise it; you have to come in to find out what it is, This is a sewing and embroidery machine with the extra length in the sewing arm to accommodate the larger hoops, and it is equipped with the Exclusive Sensor System as well. You have to see it to believe it.